Mount Scott is the highest remnant of the ancient Mount Mazama which collapsed to form Crater Lake, an 8926 ft summit located just to the east of the caldera rim. Although the SE Chute is both the longest and perhaps the best ski descent at Crater Lake, you won't find this route in any guidebook (yet). The SE Chute, which is really more of a bowl at the top, is an old avalanche chute visible from over 30 miles away along Hwy 97, dropping directly from the summit ridge for over 2000 vft. I had been eyeing this route for several years on my numerous ski road trips through the southern Cascades. Access begins from Winema NF just east of Crater Lake NP (I had checked with a ranger about this trip, who said it is OK to enter the park on foot from this point). Turn west off of Hwy 97 onto FR 66 (W Boundary Road), follow it for 3 miles to the T-junction with FR 2300, make a left and then a quick right onto FR 2308. Follow FR 2308 for several miles to its high point just above 6000 ft, just before it loops north and back downhill. On our trip, a Sven-Saw made quick work of a 4" thick pine fallen across the road a few miles in, but the road was eventually blocked by solid snow at 5950 ft. At a leisurely 11 am, we skinned up the road to its high point and turned NW up a gentle ridge, but the snow soon became discontinuous, sending the skis onto the pack. Above 6500 ft, snow cover became deep and continuous, and we skinned up the SE Ridge all the way to 8700 ft (one could also skin directly up the steeper SE Chute). We traversed left to hit the partially melted-out summit trail on the south flank, which we followed up to the summit ridge (8900 ft). Spectacular views of Crater Lake opened up before us as we rounded the flank. A quick 1/4 mile ski traverse north brought us to the summit lookout by 2:30 pm. Both the NW Bowl and the NE Face of Mount Scott appeared to hold excellent snow, but the late hour ruled out any thoughts of optional extra descents. Just after 3 pm, we skied off the snow-covered summit located just north of the lookout, and then traversed south along the summit ridge to the top of the SE Chute. We expected some instability on the initial short 35-40 degree pitch, but found none as we set off no sluffs whatsoever. The snow was heavy but still decent for turns, becoming more gloppy as the slope moderated below 8000 ft. We skied down through the well-spaced trees of the regenerating forest in the avalanche chute. It has clearly been several decades since the forest was last flattened here by a massive slide, but regular smaller avalanches have given most of the standing trees a notable downhill tilt. We skied out the bottom of the avy chute and then down the south gully of Scott Creek, finding skiable snow to 6200 ft. A quick hike down through the open forest brought us back to the snow-covered FR 2308 and out to the car by 4:30 pm. In summary: a short but sweet day, and a unique way to get a fine view of the wonder which is Crater Lake. We headed back to Hwy 97 to find some food and then towards the next stop, Diamond Peak. Amar - looks like our troop of three weren't the only ones to have a Volcano tour last week. My brother and friend and I racked 5 in 7 days for a whopping 23,400' VF of corn. What a great week for it indeed. My TRs to follow. Thanks for the trip reports - so fine to see some routes I myself want to ski (and some I have already skied) and how you logistically skied them - of course in touring fashion of the vertically inclined. Good show. 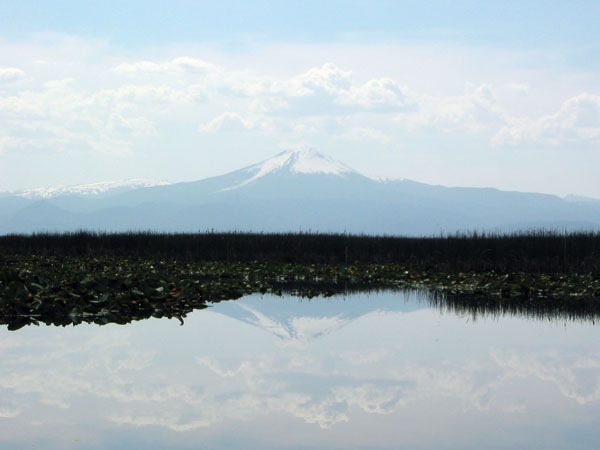 Mount Scott mirrored in the waters of Klamath Marsh, located just east of Hwy 97. This photo was taken the day after our ski descent, unfortunately late in the afternoon (it should have been a morning shot). The view looks west, and the Southeast Chute is the prominent showy chute angling down and left below the summit. Reflecting back on that day, this tour has got to be noted for the unbelievable sensation of climbing what seems like a medium sized random peak and then cresting over the ridge to see one of the most classic and unbelievable views in America.